In ITV’s “Downton Abbey,” Rose begs her “Cousin Robert” (Lord Grantham) for a wireless. Firmly established in tradition, and the “old ways,” Robert Crawley sees no need for a wireless. Until ... he learns that the King is giving a speech which will be broadcast for all to hear. For all, that is, who have a wireless. Who was the King giving the speech which convinced Lord Grantham to give-in and buy a wireless? George V, the current Queen’s Grandfather. What was the speech? The King opened the “British Empire Exhibition,” based at Wembley (in London). The image, depicted at the top of the page, is one of the posters advertising the very-popular event (which ran from April to October in 1924). When did King George V give the opening speech? On April 23, 1924. (This helps us fix the time frame for Downton Abbey’s Season Five, Episode Three). 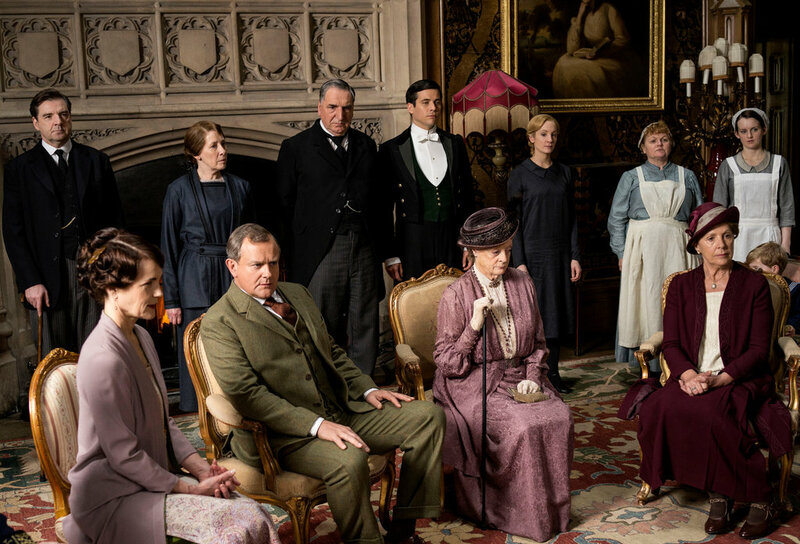 The broadcast—which the people at Downton Abbey (seen here, in a photo by Nick Briggs/Carnival Film & Television Limited, for Masterpiece) heard—was not a “live” broadcast. At this stage of the developing technology, “live radio” was still in the future. ...This British Broadcasting Company broadcast was recorded by the acoustic method -- a loudspeaker was placed before an old-fashioned recording horn -- by the Gramophone Company of London, and rush-processed into finished shellac records for a repeat broadcast in the evening. This was the first broadcast made by King George V, although more were to follow. An estimated 10 million people heard the transmission and many events around the country were suspended so that the public could listen. As it was so high-profile, early royal broadcasting may have altered the image of the monarchy. This was also, possibly, the first electronic recording made in England. British Empire Exhibition poster printed and published by the Sole Concessionaires: Fleetway Press Ltd, 3-9, Dane Street, Holborn WC1. For more images of the 1924 Exhibition, see this Flickr Photostream. 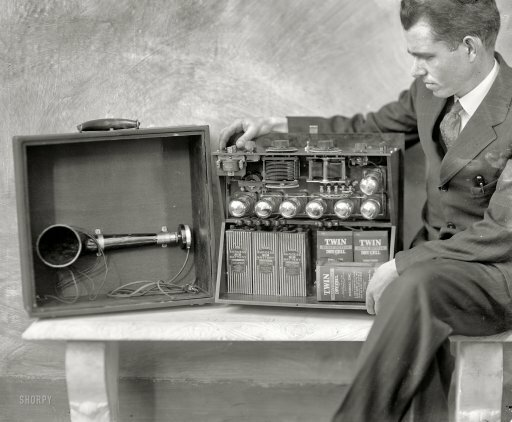 In-text image, from the Shorpy Archive, depicts a wireless, circa 1924: "Brent Daniel, formerly of the Radio Laboratory of the Bureau of Standards at Washington, with the first portable Super-Heterodyne, his own design. The seven vacuum tubes, batteries, loop antenna, loudspeaker and other necessary units are completely self-contained in the carrying case. He has been able to hear Pacific Coast stations from this outfit." Bos, Carole "Downton Abbey Gets a Wireless" AwesomeStories.com. Jan 24, 2015. Apr 20, 2019.